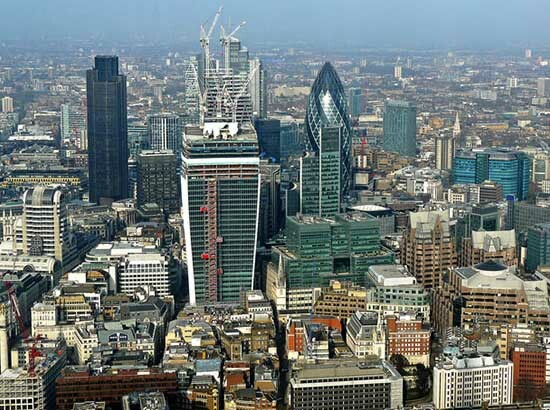 We all know that the developing countries write their future starting from a blank slate, unlike European cities who face the challenge of modifying their pre-built heritage and monuments considering to secure their energy, social and economic transition towards post-carbon, circular and interdependent urban living along. We are here with long-lasting and futuristic view in our project Tour et Taxis to emphasize the uses, technological progress, social innovation, and sustainable building principles. 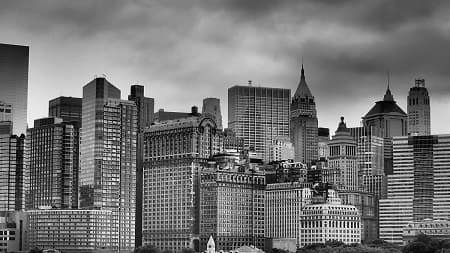 Most folks don’t know that nowadays architecture is capable of implementing a mutual balance between a piece of architectural heritage and industrial technology. The later can provide the necessary, efficient energy to the former by integrating renewable energies, thus limiting carbon emissions to the maximum extent. Tour et Taxis was built between 1902 and 1907; it used to be a large customs clearance and storage complex in the 20th century, situated at the river, road and railway gates of Brussels, Belgium. It has covered approximately 40 hectares of former wetlands quite swampy. This is an industrial park and a famous worldwide symbol of industrialization’s golden age. It is quite a good masterpiece for its engineering, ironwork, stonework and natural light. Unfortunately, It has lost its usage with the progressive transforming of Europe’s custom borders, but the neighborhood of Tour et Taxis is currently undergoing a major positive transformation, and hence it is once again in the situation of becoming an important platform for the socio-economic and cultural development of Brussels, bringing in hope for well-being and community.  The warehouses and sheds have been repurposed with industries sustainability and the knowledge economy in mind along, with a dedication to energy saving and the reuse of renewable energies over time. The foremost goal is to create a sincerely mixed eco-neighborhood where one feels pleasure to sustain life, to work, and to play. 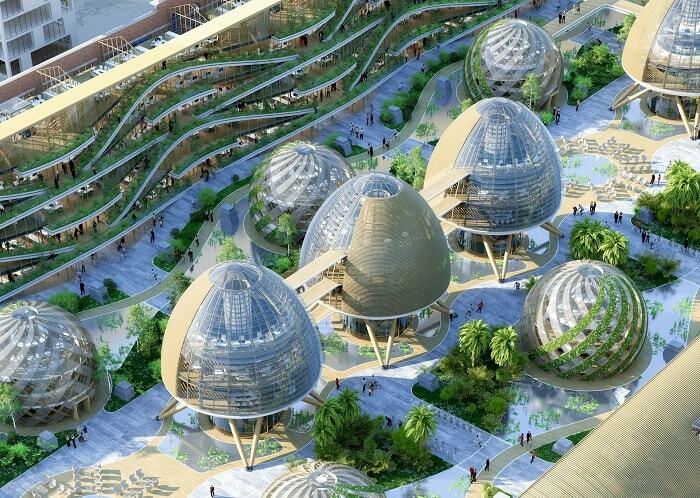 The three principles around which Vincent Callebaut’s Tour et Taxis stands are: providing vitality to pre-built heritage, enhancing sustainable communities, and safeguarding water. The project presented here is emphasizing on the “transmutations” of the Marine Terminal into 50,000 square meters of mixed-use space composed of professional activities like offices and workshops and retail activities like markets, showrooms, shops and public amenities as well. The Gare Maritime is a uniquely large and majestic architecture, and is divided into five parallel irons, cast iron and glass “vessels.” These days, it is one of the largest terminals in Europe, with a floor overall area of 40,000 square meters. In particular: The energy system is impressive due to its versatility and size. The waterproof and airtight façades realize a high thermal inertia meaning lower heat losses. Earth-to-air heat exchanger and other geothermal stations, the use of evapotranspiration, biomass cogeneration, 88 vertical axis wind turbines, altogether generating 67,76 MWh per year, and a solar and heat energy roof with a size of 18,000 square meters, which provides 2,160 MWh per year, are an uncommon huge mix of renewables. But that’s not all. A southern silicon cell façade with a size of 9,600 square meters provides further 576 MWh yearly. In the end, the GARE MARITIME is expected to be an energy-plus building generating 186% of its annual needs. The 86% excess energy, which can be supplied in real time, are available for adjacent buildings. 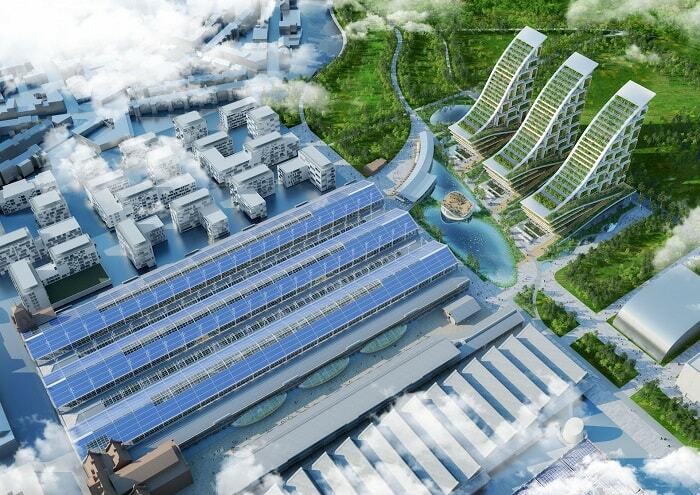 Vincent Callebaut’s Tour et Taxis concept composes of bringing the new public park and the canal inside the Gare Maritime with the sole purpose of creating a genuine BIOCAMPUS, where it feels good to work and relax. 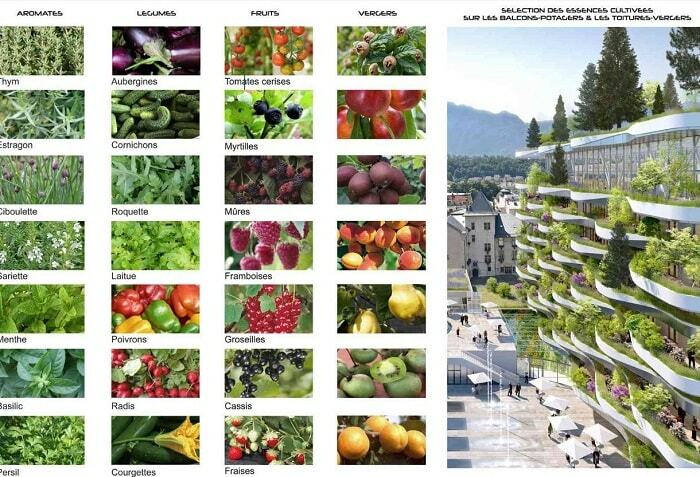 It also emphasizes on vertical vegetation and water, urban farming, and various functional spaces, forming cascades of exotic and endemic plants. 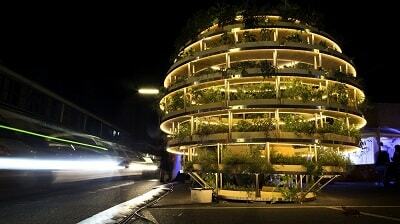 Did you ever think that an apartment building could act as an environment cleanser? With the kind of technical advancements the world of today is witnessing, anything is possible. 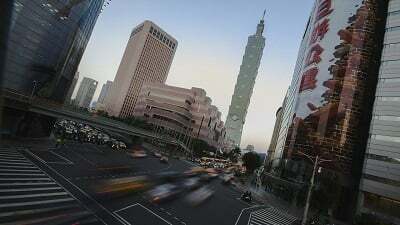 A live example is the Asian capital city of Taipei in Taiwan. 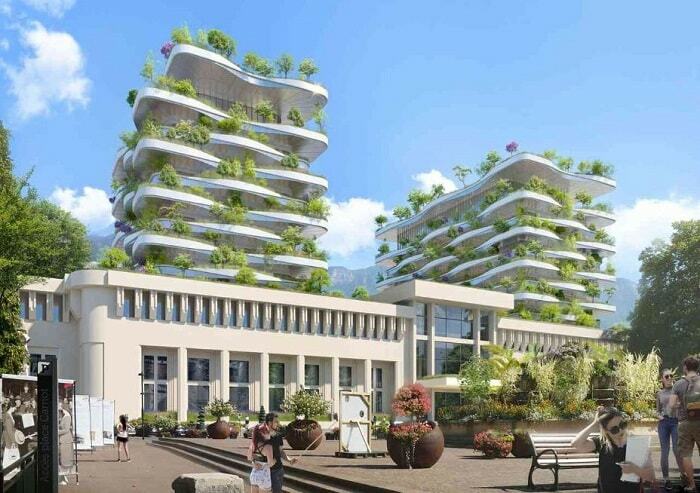 It will foresee the construction of Tao Zhu Yin Yuan Tower, a creation of Paris-based Vincent Callebaut architectures. This is no common building you can find everywhere. It’s a carbon dioxide absorbing and pollution controlling high-rise, which is largely covered by 23,000 trees and shrubs. According to estimates from the architects, they have the potential to absorb 130 tons of carbon dioxide emissions each year. This is equivalent to the emissions produced by 27 cars. Fascinating, isn’t it? 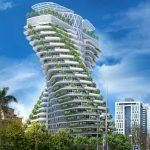 This special, one-of-a-kind tower is a 21-storey apartment complex that has been designed in a twisted manner to appear as a DNA strand – a double helix twisting 90 degrees from base to top. 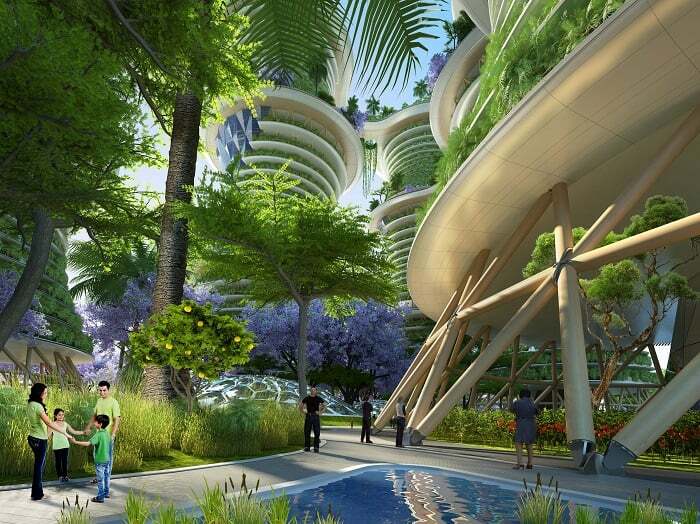 Mr. Vincent Callebaut, the brain behind the Tao Zhu Yin Yuan Tower project, believes that global warming can be effectively fought through carbon absorption and energy saving. He proudly calls himself as an Archibiotect (Architect + Biotechnologist + Technologist), a term he coined for himself. His architectural projects aim to strike an ecological balance between the humans and the ecosystem. 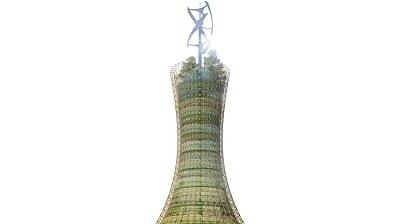 Unique concepts, such as this eco-friendly architectural design, are the need of the hour. 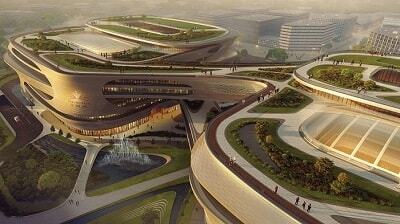 The concept is to have an eco-design in every aspect of the landscape design. According to the planning, natural lighting and sufficient ventilation play an important role. 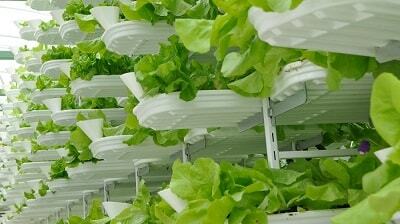 Additionally, the complex features systems to recycle organic waste and used water as well as rainwater. A rooftop photovoltaic plant partially powers the building with clean electricity. 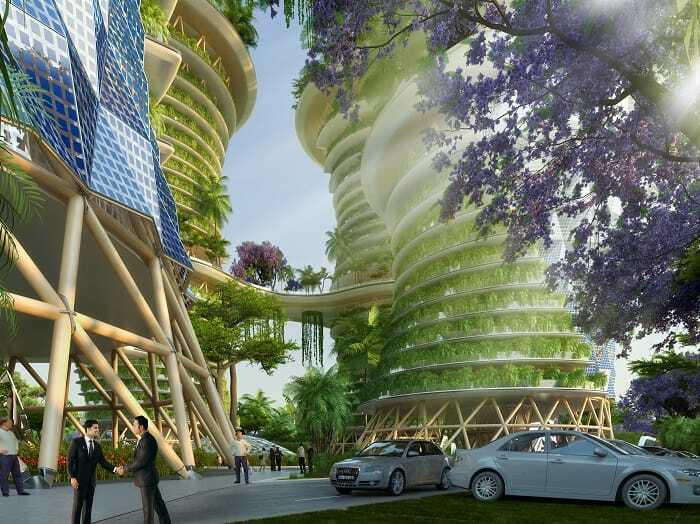 On the subject of greenery and urban farming, Callebaut’s twisted carbon-eating high-rise does not need to hide its light under a bushel. 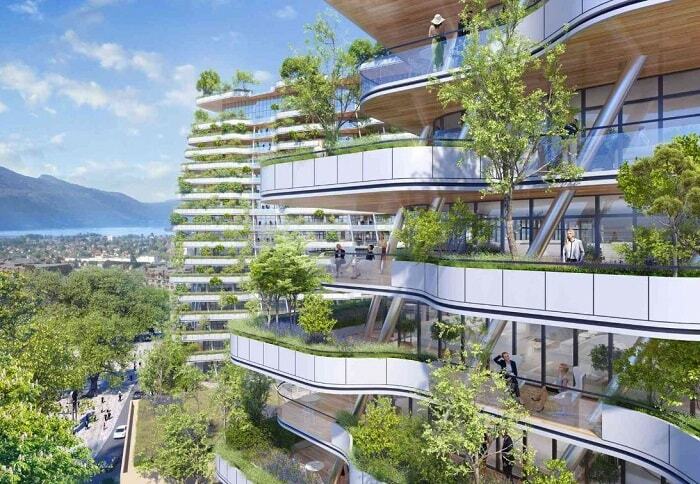 The Tao Zhu Yin Yuan Tower is to have wide planted balconies and suspended orchards, organic vegetable gardens, aromatic and other medicinal gardens. All the construction and furnishing materials are to be selected through recycled and/or recyclable labels. 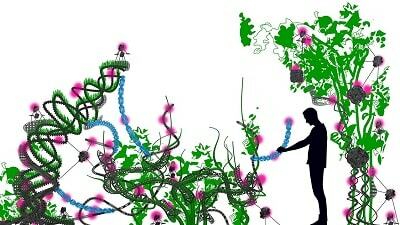 By doing this, a natural ecosystem is to be created and a symbiotic nature achieved. Taipei’s Tao Zhu Yin Yuan Tower, covered by a perimeter wall, is coiled up in the center with a heavy and luxuriant safe forest of mature trees that protects the inhabitants from the surrounding urban population. 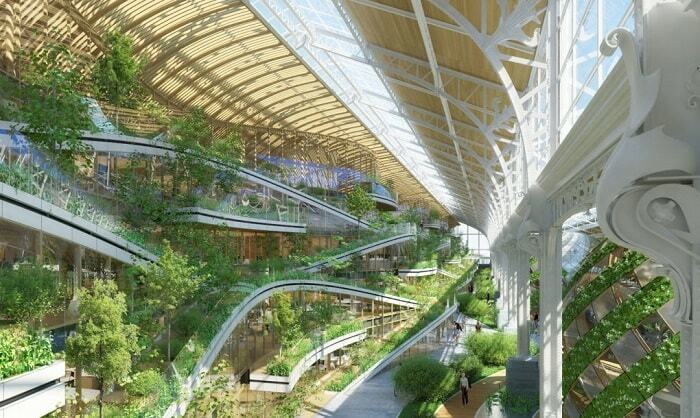 Its outline boldly displays a cascade of suspended gardens covering the entire building. 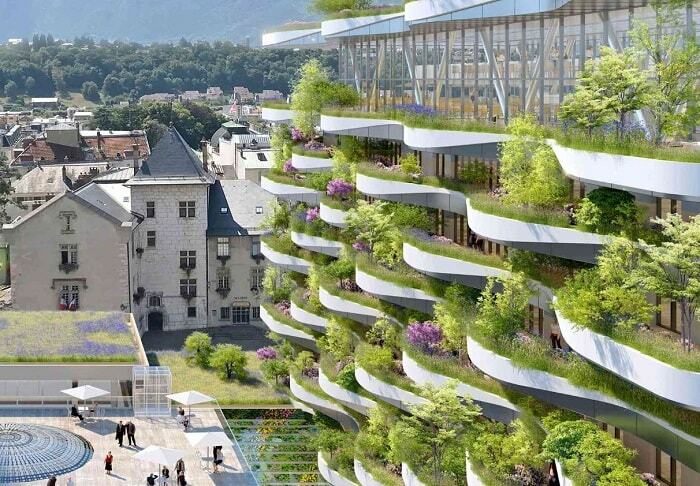 Along the periphery of each apartment, carefully placed jardinières decorate the sustainable apartment tower. These are designed in such a manner that they can be used for varied plantations like organic vegetables, flowers, and aromatic plants. Connecting them to the rainwater pipes will ensure recycling in situ. Furthermore, the rainwater is purified through the plants’ action and brought back into the ecology by gravity. The kind of lush green environment is a proof in itself of the amount of carbon dioxide that will be eliminated from the environment. 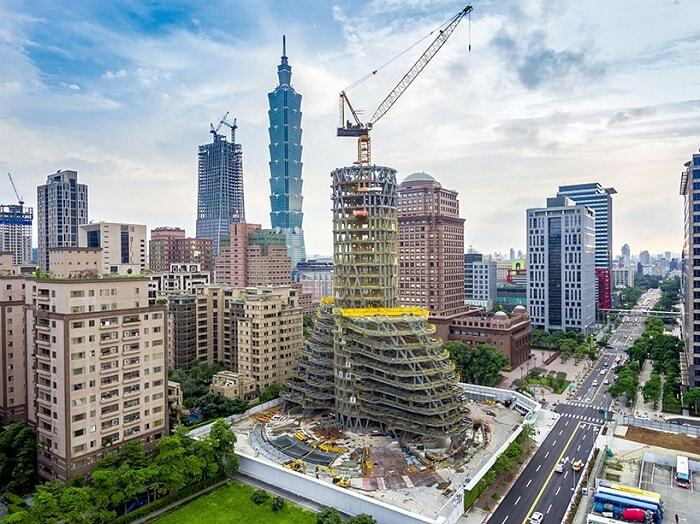 TAIPEI101 became the highest scoring LEED v4 project in the world. 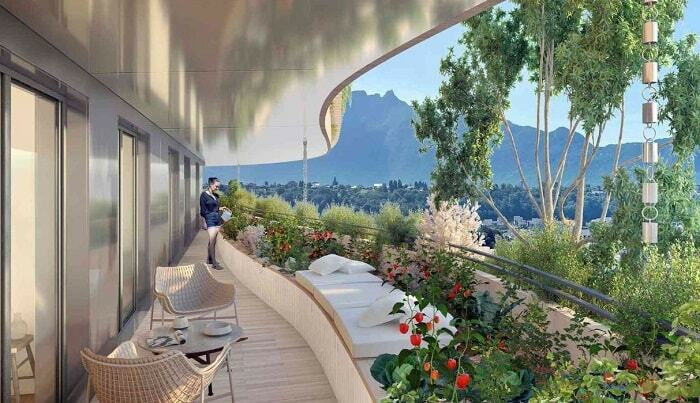 Ascending parts of the balconies being open air will benefit by receiving maximum sunshine to foster in particular the cultivation of subtropical trees, which provide shade spaces for relaxing. The descending part only partially captures sun rays what is still adequate to plant some kinds of flowers and vegetables. 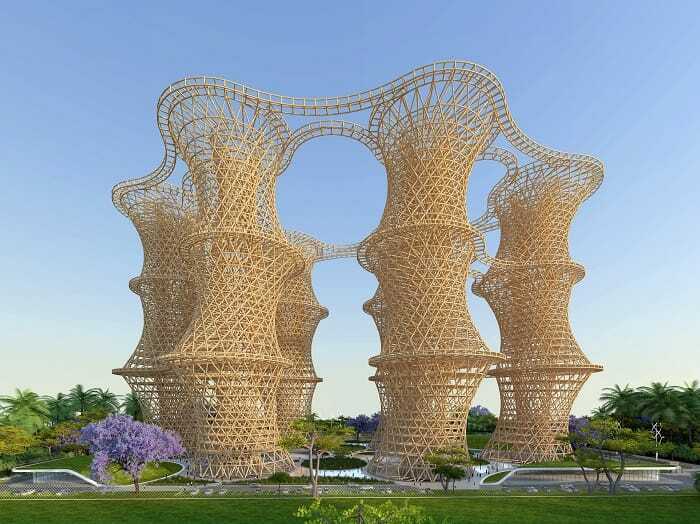 Many details of the Tao Zhu Yin Yuan Tower design are aimed at reducing the risk of global warming as well as protecting the nature and its biodiversity. This way, it is possible to protect natural resources and improve the quality of life greatly. It means that a self-sustainable environment, where human beings interact naturally with nature without causing harm, will be achieved. Thus, it is set to realize the dream of the masses to stay in a safe and eco-friendly environment. If such kind of innovation and unique solutions are achieved in every aspect of our lives, we can effectively prevent the kind of hostile environment that we are set to create for our future generations. 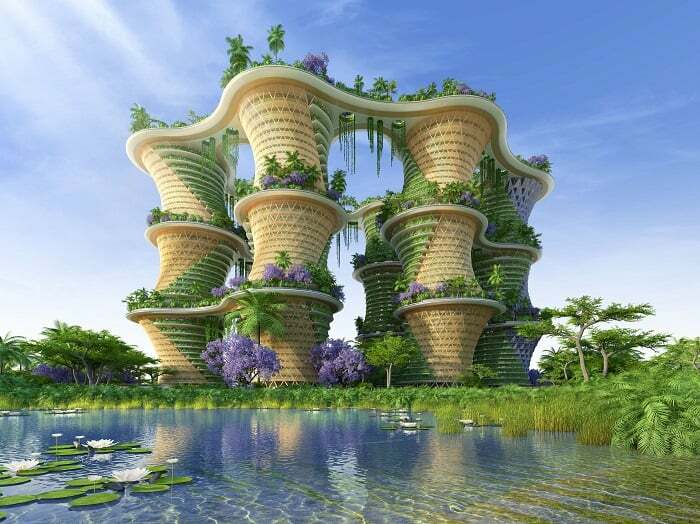 Indian agroecologist Amlankusum and Paris-based Vincent Callebaut Architectures have an extraordinary and futuristic but not unrealistic vision. It is called Hyperions. 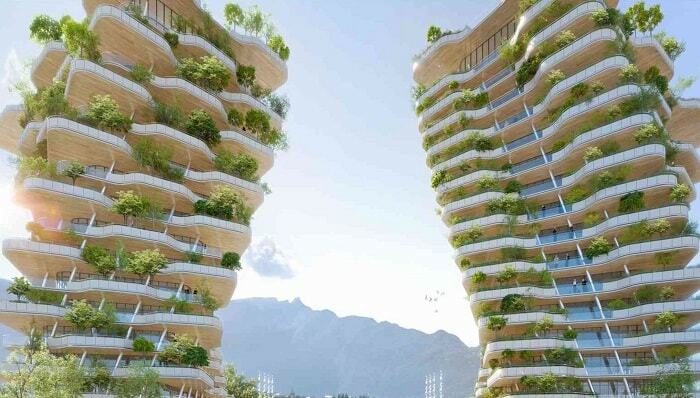 The set of six 36-story towers or rather ‘vertical farms’, each 128 meters tall, is connected by common green spaces and walkways. 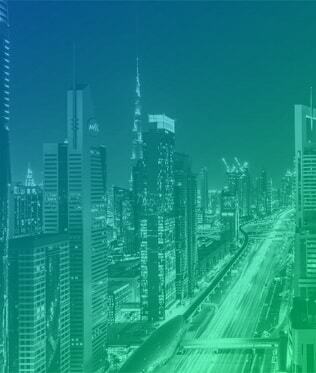 This green vision is set to be completed in by 2022 near New Delhi, India. 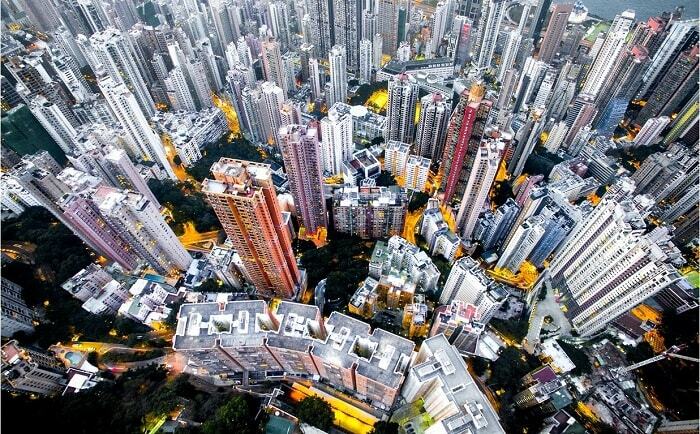 The six garden towers can be seen as a vertical village with a high social, cultural and use mix. The flexible, evolutionary spaces dedicated to business incubators, living labs, coworking spaces, multi-purpose rooms and concierge services are located behind the solar facades. 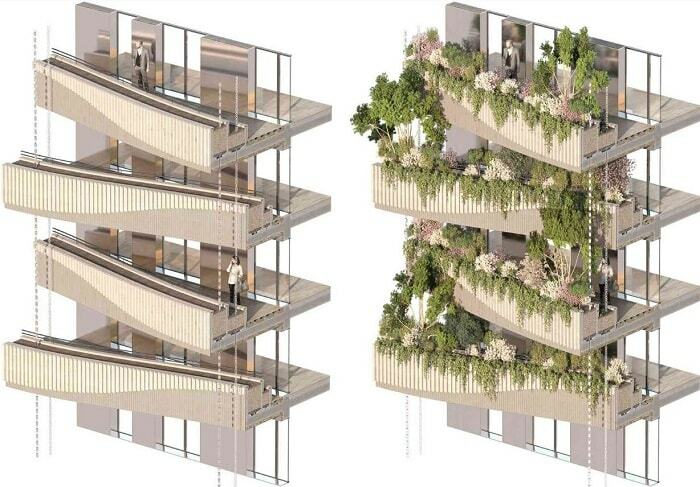 The apartments, as well as student housing, open onto cascading hydroponic balconies. The furnishings are made of natural materials such as sandalwood and tamarind. They are provided by local recycling shops, cabinetmakers and fab labs. The façades of the towers are wrapped by blue-colored, photovoltaic and thermal scales. They are able to follow the sun from East to West. In this way, it is possible to produce hot water and artificial lighting for Hyperion. 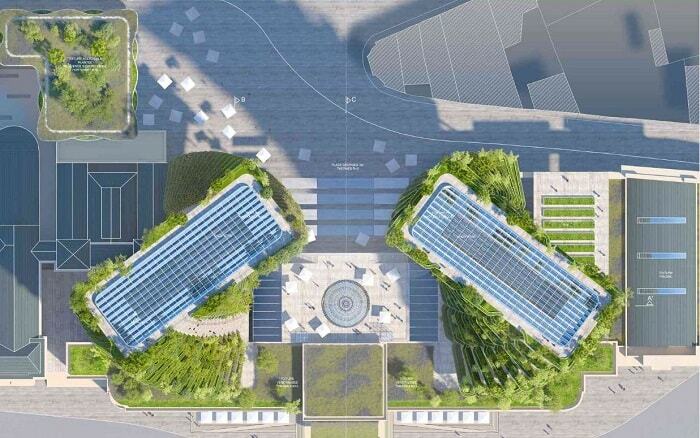 It is intended to recharge the electric vehicles in real time by the solar façades. Producing wooden materials requires less energy and is less polluting than standard materials like steel or concrete. By substituting these materials with wood, it is possible to avoid the emission of up to 1.1 tons of carbon dioxide per cubic meter. Between its CO₂-sequestrating capacity during its growth phase and its low-emission manufacturing processes, one cubic meter of wood is able to save two tons of carbon dioxide. “We the “Urban Farmers” claim that converting worldwide agriculture into organic techniques and bio-sourced construction could reduce worldwide CO2 emissions by about 40% by 2030. Hyperions is a sustainable agro-ecosystem project capable of resisting climate change thanks to its healthy economic and environmental ecosystems.”, he adds.